From Mexico. Lives in Richmond Hill, Queens. Angie hails from Monterrey, the large, industrial city right near the Mexico/US border. Her love of cooking developed at a young age, since she and her two siblings often helped out their busy, working mom in the kitchen. At 15, Angie moved to New York City to attend high school. Later, she started working as a bartender at a Mexican restaurant, where, of course, she also helped out in the kitchen. Shortly after high school, Angie married a man from Puebla (a state with a rich and varied culinary culture) and immediately started learning his native cuisine from her mother-in-law and six sisters-in-law, all excellent home cooks. 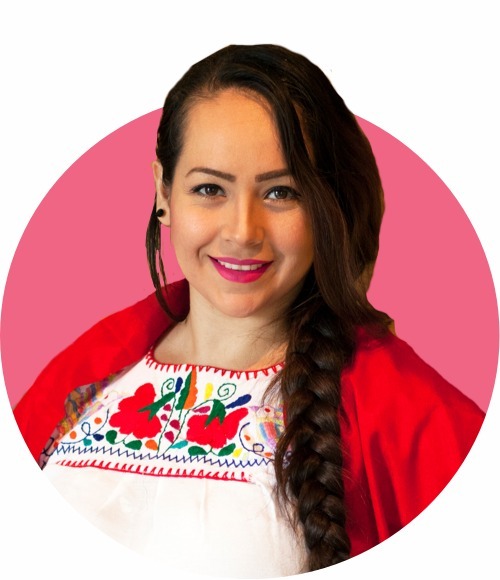 Angie is passionate about preserving Mexican tradition, as is her husband Ramon, who leads the acclaimed Mariachi group Mariachi Real De Mexico and founded the Mariachi Academy of New York, a non-profit school that offers free music lessons to children. Angie is an artist, and when she isn’t cooking or helping run the Mariachi Academy, she sings, models, and takes photographs. She is also a very proud mom to her young son, Alexander.